Chef Mathias Dahlgren takes time to share his culinary vision as well as his creative recipes for a tempting three-course menu. 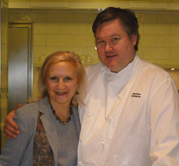 I was in Stockholm in May 2008 and had the pleasure of meeting with Chef Mathias Dahlgren after having lunch at his restaurant. Located in what was once was a private home of four apartments with 16 rooms each and is now a listed building, the restaurant had limitations when it came to design. Unable to knock down walls, instead of creating one restaurant, he decided to create two restaurants, which gave birth to the casual Matbaren, and the more formal gourmet restaurant Matsalen. Chef Mathias describes the concept as "one face with two different profiles." Matbaren has more classic presentations in a contemporary environment and Matsalen has more contemporary presentations in a classic environment, although make no mistake, both restaurants are pure Mathias Dahlgren. Before opening the restaurants at the Grand Hotel Stockholm, he was the Chef and Owner of the Michelin-star restaurant, Bon Lloc, which he and his wife ran for 10 years. 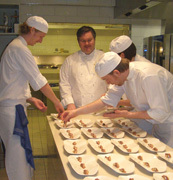 He has seen the evolution of the Stockholm culinary scene for the last 20 years working as a chef, and described Sweden as having a long food culture and a short restaurant culture. In the last 10 years more people are eating at better restaurants and prefer tasting menus. As for himself, he prefers a three-course menu and a bottle of wine, to avoid what he called "the next day tasting menu hangover" from having too many ingredients and combinations. What is next for Chef Mathias Dahlgren? After spending the past year on getting the restaurants up and running, he would love to do a cookbook, perhaps later this year. Method: Cure the salmon in the brine for 12 hours, then wash it lightly in cold water. Cut in small cubes. Cut apple and cucumber the same way. Method: Combine all the ingredients and flavor with salt and pepper. Method: Slice rye bread thin, put on non-stick baking sheet, bake in oven at 150 °C (300 °F) for about 20 minutes. Method: Whip the mustard and water, slowly add the oil. To serve: Put horseradish cream on a plate, arrange salmon, cucumber, and apple on top. Finish it off with mustard dressing and trout roe. Garnish with dill and chives. Serve with rye bread croutons. Method: Rub the steak in salt and pepper, grill on high heat in a pan. Put in oven at 130 °C (265 °F) until the center of the steak is 40 °C (104 °F). Take it out of the oven and let rest, the meat will then slowly rise in temperature to about 50 °C (125 °F). Method: Peel the artichokes and boil in salted water and vinegar until they are soft. Mix in a blender with some of the cooking juices, flavor with olive oil and some more vinegar. Mix until smooth puree, season with salt and pepper. Method: Peel the artichokes, slice thin on a mandolin. Fry in some olive oil until golden brown, season with salt and pepper. To serve: Cut the meat off the bone and slice it thin. 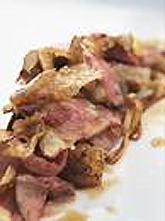 Put the meat on a plate, serve with artichoke vinaigrette and fried artichoke. Method: Melt butter and chocolate, whip egg and icing sugar, pour chocolate mixture in with the egg and sugar, fold in the rest of the ingredients, put in a piping bag. Measure about 60 grams (2 ounces) per person. Method: Butter the inside of the steel rings and cover with chopped caramelized cacao beans, fill the rings with the soft chocolate paste (above), bake in oven at 190 °C, (375 °F) for about 8 minutes. Method: Boil half of the milk with the sugar, add gelatin and dissolve, mix with other ingredients and process in ice cream machine. Method: Put the unopened can in a pot, cover with water, boil for about 4 hours, rinse the can in cold water and open. Mix with praline paste and a little bit of the whipping cream for slightly runny consistency. Method: Roast the nuts in the oven. Boil a caramel of sugar and butter. Fold in the warm nuts in the warm caramel and spread on a non-stick sheet, let cool at room temperature. Chop roughly with a knife. To serve: Bake the chocolate as described above. Put on a plate and remove the steel ring. 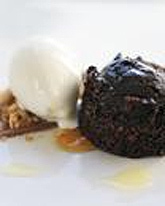 Serve with the cream cheese sorbet, hazelnut and toffee paste, and caramelized nuts. 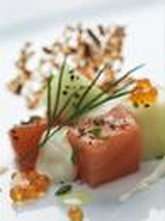 Read other articles on The Restaurant Mathias Dahlgren and the Grand Hotel Stockholm in the Hotels and Resorts, Restaurants, and Chefs' Recipes (in Swedish) sections.